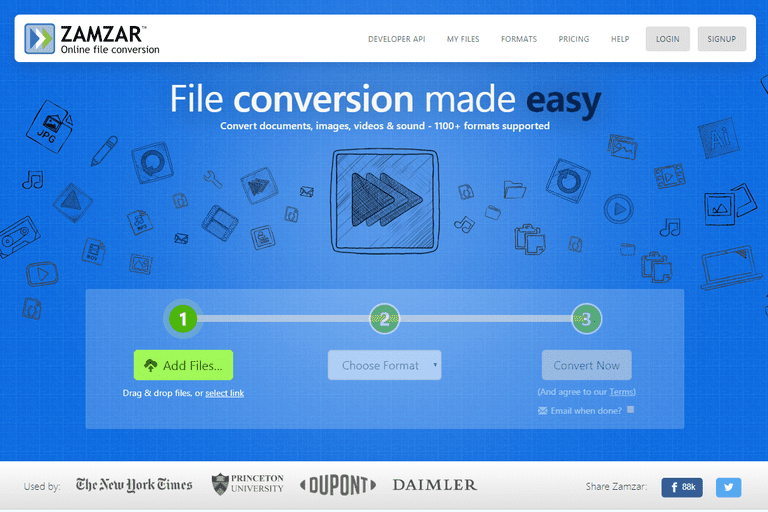 We found Zamzar to be slower than most other online file converters, but if you're disappointed with some other file converters or really need to complete your file conversion online, give Zamzar a try. Given that Zamzar is an online file converter, it immediately has unique drawbacks not seen in traditional converter software, but that doesn't mean that it should be avoided altogether. Zamzar is very easy to use. Just visit their website, upload your original files, choose the format you want to convert them to, and then hit ​Convert Now. Converted files can be downloaded immediately or you can choose the option to receive the links via email. That's it! Another, somewhat secret feature supported by Zamzar is their email attachment conversions. With the file attached (or multiples as long as each is under 1 MB), send the message to the email address that corresponds to the format you want the file to be converted to, in the syntax ​@zamzar.com. For example, to convert your PNG file to JPG, send the PNG file to jpg@zamzar.com. If you're on a phone and would like a DOCX file to be in the PDF format, send it to pdf@zamzar.com. Zamzar supports a variety of file formats. Some notable problem formats that Zamzar supports include WPD (Wordperfect Document), RA (RealMedia Streaming Media), FLV, and DOCX. Zamzar makes working with these and many other formats as easy as a few mouse clicks. Zamzar is a decent choice if you need an image converter or document converter, but the 50 MB file size limit makes it nearly impossible to use as a video converter or sometimes even as an audio converter. As the files get larger and larger, it takes longer and longer to upload, convert, and then download again. Plus, most lengthy videos surpass 50 MB. It should also be noted that Zamzar has an optional, tiered premium service — Basic, Pro, and Business — with increasing maximum file sizes, online storage space, the speed of conversion, and so on. We only tested the free service, so some of my experiences with Zamzar may or may not have improved if we had used one of the premium tiers.